One of the acclaimed action film directors of our time, Tony Scott, ended his life yesterday at age 68 by jumping off a Los Angeles bridge. The obits headline him as "Ridley Scott's brother" and "director of Top Gun." He also directed blockbusters like Days of Thunder and Crimson Tide. If you look down the list of his directing titles, you'll notice leads like Tom Cruise, Gene Hackman, and Denzel Washington. 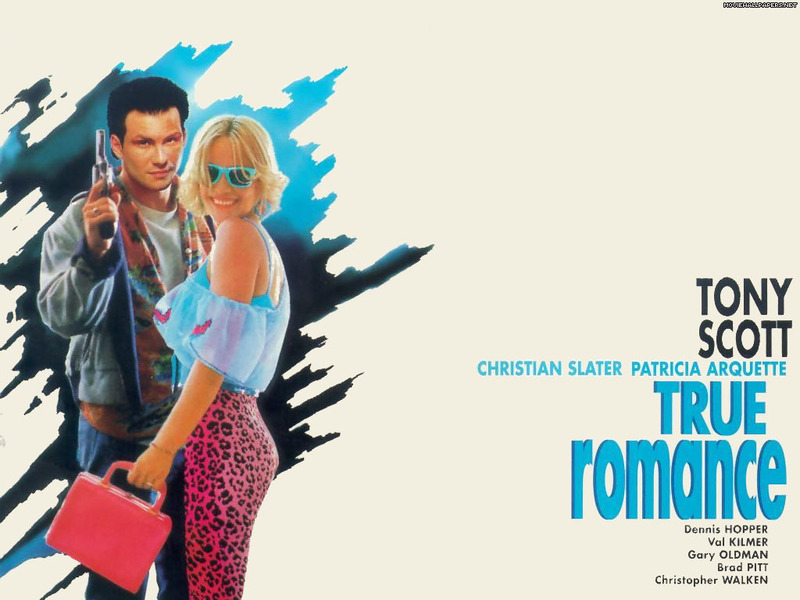 None of whom appeared in one of the great ensembles of all-time, my single-favorite movie for years, and the first DVD I ever purchased: True Romance. The production's history is filled with some urban legend. Did Quentin Tarantino really sell the script for just $20K before he was established? How much was ripped off from Terrence Malick's 1973 guy-and-girl crime spree Badlands? How much did Scott himself copy the style of Chinese director John Woo for the final 3-way shootout? But the film's performances are undeniable and the top scenes are epic. Clarence (Christian Slater) goes to the Detroit ghetto to see the notorious Drexl (Gary Oldman) and "negotiate" for call girl Alabama (Patricia Arquette). But neither side has any intention of negotiation, and when Clarence offers an empty envelope all hell breaks loose. Clarence kills Drexl in cold blood. "Shoot him in the face, put him down like a dog," is the way it was phrased to him by his bathroom apparition Elvis (Val Kilmer). He grabs a suitcase that he thinks is Alabama's things, but it actually contains several hundred thousand in uncut cocaine. That moves the story from Detroit to LA. Detroit mobster Vincenzo Coccotti (Christopher Walken) tracks down Clarence's blue-collar security guard dad (Dennis Hopper), looking for the missing coke. After enduring much intimidation, some physical punishment, and mild torture, Clarence's dad doesn't give him up. In fact he launches into a diatribe about how "Sicilians were spawned by N*****s," and gets himself executed instead of talking. "I haven't killed anyone since 1984." So he didn't get the information he came for, but on the way out one of his henchmen finds Clarence's contact in LA posted on the fridge. When Clarence goes out to get some burgers, Alabama goes back to the hotel room to find a sadistic mob enforcer (a young and skinny James Gandolfini) waiting for her. He beats her senseless trying to get her to spill on the coke - until he realizes it's under the bed. Then he gives her one free shot before he kills her. Bad idea. Alabama uses whatever she can find (a swiss army knife, Elvis paperweight, hotel bath shampoo, hairspray and a lighter) to survive the battle to the death. The movie is brutally violent, but all the plot lines fit, and the dialogue is superb. The coke deal goes down at the Beverly Ambassador and the shootout between the the movie producer's hired guns, the cops, and the mob was a little too gun-heavy for my taste. But ultimately it's the story of a couple of imperfect kids trying to make it in an imperfect world by imperfect means. And it's an imperfect movie, but it's great. Thanks Tony Scott.